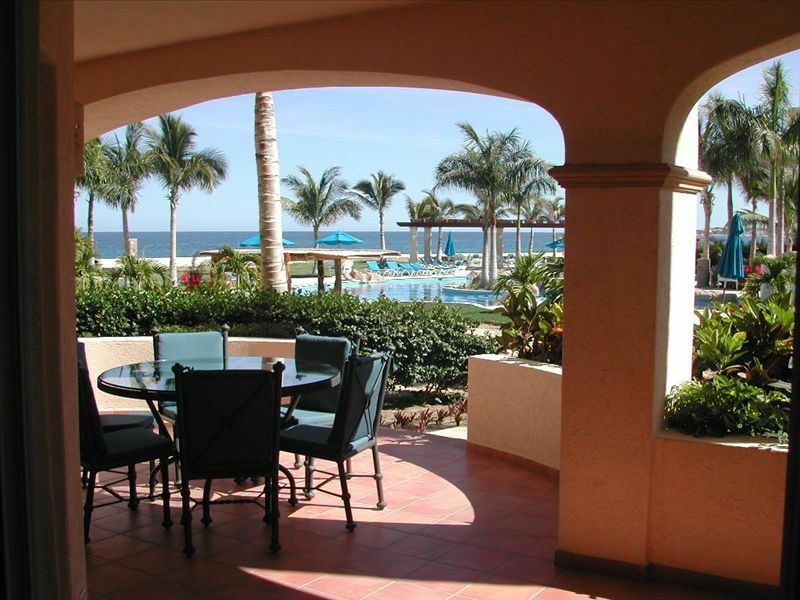 This oceanview condo is situated at the beachfront resort, Las Mañanitas, and is luxurious and spacious. This unit is located in the Oceanfront First Phase One 1 complex at Las Mananitas, unlike other units in the 2nd or 3rd phase set behind us and next to the highway. It features carefully chosen furnishings and is absolutely gorgeous. Enjoy a 50-inch HDTV, satellite TV and DVD player. The unit is fully air conditioned, equipped with a UV water purification system, includes all other amenities you would expect in a condo of this quality. Includes *FREE WI-FI, local and US calling*. You are renting this Las Mananitas Phase 0ne 1 condo by the owner, Bruce and Masami Handloff. We take pride in San Jose del Cabo, Las Mananitas, and keeping our beachfront condo well stocked and immaculately maintained. Our ground floor, 1900 square foot condo features two large bedrooms and two bathrooms including one master suite with a private bathroom with separate tub and shower. The sleeping accommodations include one King bed in the master suite and two full beds in the second bedroom. Check in is after 1:00 pm; check out is before 10 am. Sorry, due to resort rules, pets of owners are allowed, but not guests. No smoking, please. There is a spacious ocean view patio with a beautiful eating area, reclining area, and a private yard and path with walk-in/out direct access to the beach, swimming pools, hot tub and barbeques. The resort also has a fully equipped fitness center and tennis courts. The fully equipped kitchen features kitchen amenities you'd have at home, such as a coffee maker, blender, toaster, microwave, 4 burner oven, dishwasher, refrigerator, full collection of pots, pans, knives, dishes and flatware. The unit has 6 beach towels in it's private laundry room, beach chairs with umbrella, and an assortment of pool and beach toys. The 2 bathrooms have double sinks and showers; the master bath also has a deep soaking tub and a hair dryer. A personalized combination safe is available for free to keep your valuables safe. (2) 50-inch HDTV with Home Theater Sound System and DISH satellite tuner in living room and a second TV (27" CRT) with DISH satellite tuner in the master bedroom. Another wonderful week in a perfectly setup condo. Unit 103 is one of the best vacation rentals we've ever stayed at. The description and photos accurately reflect the property. Sitting at the table on the patio each morning, looking out at the grounds, the pool and the ocean, made me feel like I was living in a brochure picture. Everything was so well maintained and beautiful. Inside, one of the best features for comfort is that each bedroom and the living area have their own ac controls and ceiling fans. You do not need to rent a car, as the taxis and buses stop right outside the front gate. There is a hotel across the street so there are always taxi's there. If you don't want to or are unable to walk up to the front gate, you can call the front gate and they will call the taxi for you and send them down to the parking lot outside the building. We took a taxi to the plaza of old downtown San Jose del Cabo several times during our stay and the fare is $7.00 US each way. The owner was great to work with, very responsive and nice. Usually we don't stay at the same place twice, but I don't think we can find a better place for our needs in San Jose del Cabo, so we'd definitely try to book here again if/when we get back to Cabo. Favorite condo at Las Mananitas!!! It has a great location and comfortable leather reclining furni! We have been staying at Las Mananitas for several years and we finally found the perfect spot. We have enjoyed almost every condo because of different reasons but this one has it all. The reclining leather furniture is the best we’ve experienced for our bad backs!!! I don’t know that everyone puts comfort over “fashion” but it’s at the top of our list. The beds are also extremely comfortable as well as the furniture on the deck. Bruce was so easy to work with and responded immediately to any questions we had. The condo has everything you might need or want. The location is perfect, ground floor with a beautiful view of the ocean and pool. In October 2018, we have spent two amazing weeks in Mr Handloff's condo. The unit does completely live up to expectations, even manages to exceed them! Everything is as described and we had a wonderful stay. Las Mananitas is extremely well maintained, the pools and jacuzzi are perfect, same goes for the fitness room and tennis court. Security is top notch. Being located on the ground floor was simply perfect: you are literally a couple of steps away from the pool and the beach is within a stone's throw distance. Two big malls are very close by, a couple of minutes walking is all it takes. As long as you comply to the Las Mananitas property rules, you are all set. If you don't you will be kindly reminded about this by security, who are just the messenger in this case as some (permanent?) inhabitants of other condo's really see to it that all rules are strictly observed. No worries though, as the rules (there are not that many, really) all are aimed towards safety and keeping the premises looking clean and tidy. Communication with Mr Handloff has been excellent, response times always were lightning fast, both before and after arrival. Let's not waste any more words on this, all you need to know is: Las Mananitas Condo 103, is highly, highly recommended! Muchos gracias por todo, Bruce! Las Mananitas is awesome - quiet and secure! We have space for our teenage boys to hangout - tv, wifi, four pools, fitness room, and the beach. I go to San Jose del Cabo yearly. This was by far the most lovely place I've stayed. The amenities were perfect. The condo had everything we needed. The beds were comfortable. When we come back next year, we will definitely stay here again!